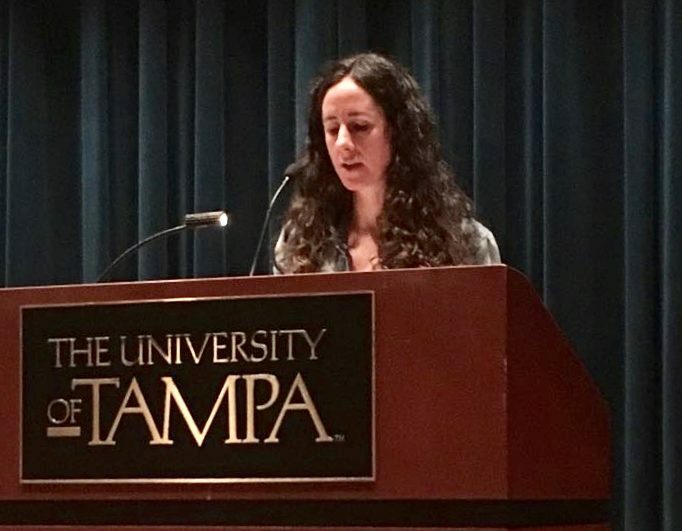 UCC’s creative writing programme made a splash at this year’s AWP Conference in Tampa, Florida. Director of Creative Writing, Dr Eibhear Walshe and PhD candidates poet Kathy D’Arcy and fiction writer Niamh Prior read from work in progress on a panel entitled “Out From Under the Influence: Irish Writers Reach Beyond Post-Colonialism.” They were joined by the 2014 winner of the Frank O’Connor Prize, Colin Barrett. The AWP (Association of Writers and Writing Programmes) Conference & Bookfair is the largest literary conference in North America and a linchpin of the cultural year for professional writers, teachers of writing, students, editors, and publishers. Over 12,000 people attend, with over 2,000 presenters and 550 readings, panels, and craft lectures. The book fair hosts 800 presses, journals, and literary organisations from around the world. After the conference, Kathy D’Arcy, Niamh Prior and Colin Barrett went on to give a reading at The University of Tampa to an audience of faculty, students and members of the public and visited Dr Kathleen Ochshorn’s Irish literature class where they read from their work and discussed the theme of writing and “Irishness”. Kathy D’Arcy, Colin Barrett and Niamh Prior at the reading in the University of Tampa, Florida. This entry was posted in News on April 23, 2018 by Mary Morrissy.